YouTube has integrated Google+ into the sites comment system meaning users need a Google+ account in order to comment. 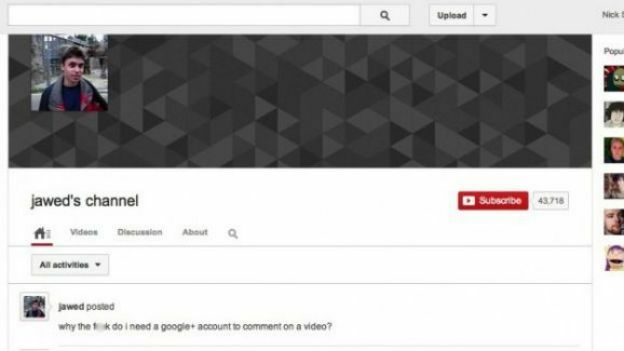 YouTube co-founder, Jawed Karim, has posted the first comment since uploading the first ever video on YouTube titled 'Me at the zoo' stating "Why the f**k do I need a Google+ account to comment on a video?" It is unclear whether Jawed is behind the comment or wheher it was an account hacking. The move by YouTube has also been opposed by the sites biggest user, Pewdiepie, who has stated in his video description that, "due to the recent changes of the YouTube comment system I'm forced to disable comments. Since front page/top comments are filled with: Links to virus sites, advertisers, self advertisers, spam, copy and paste pics of dogs..."
The solution that Pewdiepie makes is that YouTube allows the ability to disable top comments. The new system also means that comments are viewed by how relative they are to you personally rather than in time order. Last month it was also rumoured that YouTube will be launching a music and video streaming service this year.